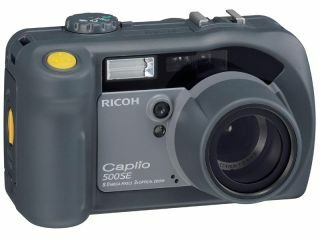 Ricoh 's Caplio range of rugged semi-pro digital cameras received a boost this morning in Tokyo with the welcome addition of Wi-Fi to the 500SE model. The new 500SE W improves on its older sibling, the 500SE B, by adding 802.11b/g to an already-rich feature-set that includes Bluetooth, an 8.1-megapixel sensor and a tough, shock-resistant body. The Wi-Fi can be used to send photos to a PC or PDA, while the Bluetooth link is intended for hooking the Caplio up to a GPS unit or to a phone when out of wireless coverage. The 500SE range is aimed at the likes of building-site foremen and people working in similarly demanding environments and all models are waterproof to a depth of 1m.